Traditional wedding vows knit the soul of the bride to the groom�s soul so they are as one being. Such an intertwining might be most romantically depicted in the choice of braided wedding bands. Threads of gold or silver twisted together into a beautiful plait form a picturesque representation of Shakespeare�s �marriage of true minds.� Braided wedding bands, whether rustic with wide plaits or intricate with a delicacy of fine strands interwoven, manifest the unity of no longer distinguishing where you end from where he begins. You are as one mind, flesh and spirit. Read more. For thousands of years the aquamarine has captured both eyes and imaginations. The Sumerians, Egyptians and Romans all held this gem in high regard. The brilliant beauty that has made aquamarine a perpetual favorite allows this stone to give a range of rings a gorgeous touch of the clearest sea. Braided wedding bands unite the traditional simplicity of a plain golden ring with the embellishment of single or multiple strands intertwined. A heavier braid of single strands adds a distinctly Celtic air to your braided wedding band, while a more elaborate arrangement of many twisted tendrils plaited together calls to mind the whimsical and romantic tiny braids worn as part of the elegant hairstyles of Victorian and Edwardian brides. As braided wedding bands are perfectly suited to both men and women�being a universal motif of union rather than a feminine floral design�the bride and groom could select matching rings or each could choose the braided style that appealed most to themselves to show both their togetherness (in wearing both braided rings) and individuality (by acquiring slightly different variations in the details). A bride might prefer an intricate tri-color braided ring to coordinate harmoniously with all her other jewelry so it blended well with silver or golden accessories, while a groom might prefer a heavier-looking matte finished sterling silver with the patina of gunmetal for a very masculine braided wedding band. The bride and groom can also interpret their own relationship through the available choices of braided wedding bands. If you prefer to envision their marriage as the incorporation of two distinct individuals, you will find a variety of braided wedding bands depicting the plaiting of two strong threads into an even stronger unit. While those who view their bond as the interlacing of the many facets of their personalities and interests might prefer a braided wedding band with multiple strands. 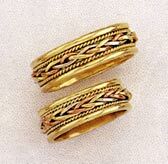 Certainly, every couple will find an appealing braided wedding band design to suit the romantic joining of their lives.